Muirapuama is a bush or small tree that grows up to 5 meters high and is native to the Brazilian Amazon and other parts of Northern Brazil. The small white flowers have a pungent fragrance similar to that of Jasmine. Historically, all parts of the plant were utilized, but it is the bark and root that is used in modern preparations. It has long been used in the amazon by indigenous peoples for a number of purposes, and the plant found its way into herbal medicine in South America and Europe in the 1920s. Early European explorers noted the indigenous uses and the qualities of Muirapuama and brought it back to Europe. Because of the long history of use of Muirapuama in England, it is still listen in the British Herbal Pharmacopoeia. 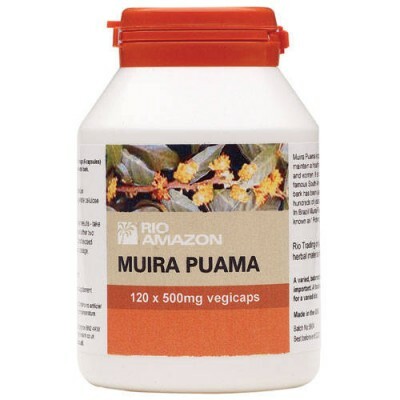 Scientists began searching for the active components in the root and bark of Muirapuama to determine the reasons for its efficacy in the 1920s. Early researchers discovered that the root and bark were rich in free fatty acids, essential oils, plant sterols and a new alkaloid. 2 capsules each morning and 2 more before retiring. Pure powdered muirapuama bark (Ptychopetalum). Capsule shell: vegetable cellulose. Click the button below to add the Rio Amazon Muirapuama 60 Caps to your wish list.